I just installed a bell on my bicycle. After 4 years of commuting by bike, I’m slowly dropping my cyclish habits. I also have to credit the friendly writers at WaterlooBikes.ca for raising my awareness of the harm caused by agressive cycling habits. 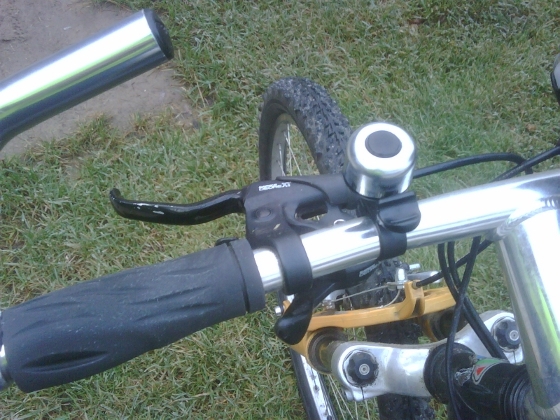 I bought the Incredibell BrassSolo at Ziggy’s Cycle & Sport for $15.99. No longer will I silently wizz pass pedestrians scaring them. Now I can make them jump with the angelic ding of a bell. The pedestrian traffic on my route home has increased dramatically with the opening of the Engineering 5 at the University of Waterloo. It’s the first of two new engineering buildings slated east of the railroad tracks and the Laurel Trail (part of the Trans Canada Trail). So although I like to sprint home from work, I temper my inner-cyclish. I want everyone to enjoy these trails and the wildlife seen along it. I have a black bell that looks like that. It’s quite loud (except on days like today when rain gets in it). Not sure how pedestrians are there, but when I’m on out multi-use trails, pedestrians walking four abreast or walking down the middle refuse to move over an inch when I ding my bell. This bell was comparatively expensive, but it’s supposed to work in the rain. I have the same complaint regarding pedestians on shared pathways, but I’ve always been nervous about someone swinging their arm or stepping into my path as I’m scooting by – I’d hate to cause an injury. Graham’s the most compliant of any of the writers here, at least, he’s the only one with a bell. Vote Graham for Waterloo Bikes compliance officer! Rob – go buy one! I really need a bell. And a light. Perhaps a bell that works also as a light. I think that, in our efforts to get motorists and nervous cyclists to see cyclists as traffic, we need to make the same efforts, including both education and enforcement, to ensure compliance as we do with cars and their owners. If a car doesn’t have working lights or a working city horn, and they are found out, they will get ticketed. The very same should be true for cyclists who do not have a bell. Or working front and rear lights for night travel. Or cyclists riding on sidewalks, running through stop signs and red lights, or going the wrong way on one-way streets. They need to be ticketed. NYC is a good example of recent strides in making the city more cycle friendly, and there you can have your bicycle confiscated for riding on the sidewalk. If we want to be taken seriously as traffic, and to be treated with the respect we deserve as traffic on our city streets, I would think we should also be willing to bear the responsibilities of being traffic. That means compliance. I can partly agree with what you are saying Abram. I’m all for rules of the road being followed by all road users. I will point out that any bell I’ve owned has no chance of being heard and is therefore useless in traffic. The only place they are really useful is on multi-use trails. Bike lights, stop signs, yes. Bells, that’s just compliance for compliances sake. You are right, of course, that a little ding-ding bell in busy automobile traffic will not likely be heard. However, most of us spend time cycling on both busy roadways and on multi-use trails, so the bell is still useful and necessary, imo. And I have seen air-powered horns for bicycles that is comparable to a car horn (see http://deltacycle.com/Airzound-Bike-Horn for one example).